James J. Healy originally joined Cowdery & Murphy, LLC in 2010 after serving as a law clerk to the Honorable Christopher F. Droney on the United States District Court for the District of Connecticut. 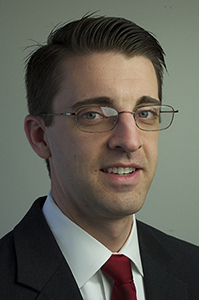 In 2012, Mr. Healy returned to serve as a law clerk to Judge Droney on the United States Court of Appeals for the Second Circuit, and rejoined the Firm in 2013. Mr. Healy is engaged in the Firm’s civil, white collar, and appellate practices. He represents clients in criminal and civil matters in state and federal courts, both at trial and on appeal. Along with Thomas Murphy, Mr. Healy tried a wrongful death case in Connecticut Superior Court, securing a multi-million-dollar jury verdict. For these efforts, he was inducted into the Connecticut Law Tribune’s Personal Injury Hall of Fame. In 2015, the Connecticut Law Tribune recognized Mr. Healy as a “New Leader in the Law.” Since 2016, he has been selected for inclusion in Connecticut Super Lawyers ®. Mr. Healy earned his A.B. in Government and History, with distinction, from Cornell University in 2006 and his J.D. from the Duke University School of Law in 2009. He is an officer and executive board member of the Federal Practice Section of the Connecticut Bar Association. Mr. Healy also serves as a panelist for the Connecticut Trial Lawyers Association’s annual Supreme and Appellate Court Review presentation.